Plan of the old city of Carcassonne. Main access (red line) is from Exit 24 on the A61 motorway (Carcassonne east) . With its 3 kilometres of defensive ramparts, the old city of Carcassonne is one of the largest surviving medieval walled cities in Europe. As a natural defensive spot beside the River Aude, the site has been occupied and fortified since before Roman times. It was a Roman stronghold, before being ceded in the 5th century to the Visigoth king Theodoric II. From then until the 14th century, the fortress of Carcassonne remained one of the main strongholds in an area that was much fought over by dukes, kings and counts from the north and from the south. Back in 1840, when few people other than artists and poets were interested in old buildings, a young local councillor in Carcassonne, with a passion for old buildings, managed to get the ancient Basilica of Saint Nazaire, in the old city, classed as a historic monument. Jean-Pierre Cros was just in time. While Carcassonne had for many centuries been an important fortified bastion on the main route between the Languedoc coast to the southeast, and the plains of Gascony to the west, its strategic importance had dwindled with the forming of modern France with a national border running the length of the Pyrenees. By the 18th century, Carcassonne's fortified garrison no longer served much purpose, and the city was progressively abandoned by the army. In 1849, the government declared that the fortifications of Carcassonne were henceforth redundant, and should be pulled down – as happend to the fortifications of most other historic French cities. 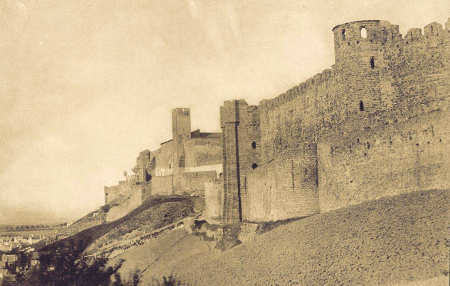 The ramparts of old Carcassonne in 1851, before the start of renovation. Cros led local opposition to the demolition plan, and enlisted the support of Prosper Mérimée (the novellist best known as the author of Carmen) who was by then France's inspector of historic monuments. With the basilica already classed as a historic monument, Cros and Mérimée managed to persuade the authorities to extend the classification to include all the medieval city and its fortifications. In 1835, Mérimée – whom we need to thank for the saving of many of France's greatest historic monuments – had already written of Carcassonne that "The old town is more interesting (than the new town). It's double row of medieval fortifications could be the subject of major studies into medieval military architecture" (Notes d'un voyage dans le midi de la France) ... but that the old town was increasingly derelict and its old buildings inhabited only by the very poor. No longer needing to live in the protection of the city walls, most of the city's wealthier inhabitants had moved out and built new houses and new municipal buildings in the new town, on the flat land below. For better or for worse, the man entrusted by Mérimée with the restoration of the old city of Carcassonne was France's leading gothic-revival architect, Eugène Viollet-le-Duc, who had already taken charge of the restoration of Mont Saint Michel in Normandy, Notre-Dame cathedral in Paris, and the great basilica of Vézelay in Burgundy, among other projects. Passionately interested in medieval architecture, Viollet-le-Duc, like other gothic-revival architects artists and writers in France, Britain and elsewhere, had a romantic view of medieval life which coloured his work. Thus Viollet-le-Duc took a fairly liberal standpoint when designing new gothic buildings or renovating old ones, and his renovation of Carcassonne was no exception. A Parisian by birth, his image of how medieval buildings might have looked at their prime was largely influenced by the old architecture of northern France; the result is that while the ramparts and old buildings of Carcassonne are basically genuine medieval structures, they got embellished in a medieval style more typical of northern France than of Languedoc. The sloping slate roofs of the towers of today's Carcassonne would be at home in Brittany; until the 19th century, the towers were capped by much flatter roofs using the red earthenware "Roman" tiles that characterise the architecture of most of southern France. More generally, Viollet-le-Duc was, and still is, criticised for having over embellished the fortifications, adding battlements and improving the look of the old city, to make it into the an example of what a medieval city ought ideally to have looked like, rather than how Carcassonne actually was. But even if many details of the restoration work at Carcassonne were the fruit of Viollet-le-Duc's artistic licence, most of Carcassonne is "genuine" to the extent that Viollet's designs were based on his own very detailed knowledge of the architecture of the Middle Ages. Besides, the walls and the buildings in the old city are authentic medieval structures; the rebuilding of Carcassonne in the 19th century embellished what already existed, in did not create something from nothing. Thanks to Cros, Mérimée and Viollet-le-Duc, the old city of Carcassonne was thus saved from demolition and restored to more than its original glory; and officially protected as a historic monument since 1862, and in spite of Viollet-le-Duc's over-fanciful restoration, Carcassonne remains one of the finest and most complete examples of a fortified medieval city anywhere in the world. In 1997, the old city's importance was confirmed when it was listed by UNESCO as a World Heritage Site. Essentially, the one thing to see in Carcassonne is the old city. Entrance to the old city is free of charge. However there is a fee for the car parks close to the old city. In 2018, the rate for cars is 30 free minutes, then charged at 1€ per 15 minutes up to two hours, thereafter 0.50€ per 45 minutes. So most visitors - assuming at least two hours to visit the old city - will pay a parking charge between 6.50 €uros and 8 €uros. Within the city, the narrow streets are nowadays lined with restaurants and tourist boutiques. Acces to the ramparts is through the city's keep, the Château Comtal (point C on the plan). Visitors have access to a part of the ramparts, from which to enjoy magnificient views out over the new town, the surrounding countryside, and to the mountains to the north (Montagne Noire) and south (Pyrenees). Entrance rates for the Château and ramparts in 2018 are 9 € full rate, and 7 € reduced rate. Access is free for under-18s in a family group, and is also free for 18-25s from EU countries (passport or ID required). Online ticket sales: see official historic monuments site. Bazilique Saint Nazaire (in brown on the plan). At the southern end of the old city, the Basilique Saint Nazaire, built in the twelfth century, is a fine example of southern French romanesque and gothic architecture. It contains some significant medieval stained-glass windows, notably two beautiful rose windows in the north and south transepts. While the interior is largely medieval, the exterior was embellished by Viollet-le-Doc's restorations in the 19th century. The city gates. The old city has two main gates, the Narbonne gate in the east, and the Aude gate, below the château, in the west. Both have been considerably renovated. The porte d'Aude : the gateway itself dates from the Visigothic era, but most of the superstructure is Viollet-le-Duc. The Porte de Narbonne : the gate was considerably embellished by Viollet-le-Duc who notably added the drawbridge which did not exist before. The Canal du Midi - the historic 17th century canal, the oldest major canal in Europe, which allowed boats to cross from the Mediterranean to the Atlantic ocean, via Toulouse, the river Garonne and Bordeaux. Le vieux pont. 210 metres long, the Old Bridge, crossing the River Aude below the Porte d'Aude, is a well preserved 14th century bridge. By air Carcassonne airport is served directly by Ryanair. For details of flights from the UK see Fly to France. By car Carcassonne is beside the A61 "Autoroute des deux mers" motorway, that runs from Bordeaux to Narbonne. For the old city take exit 24, signposted Cité médiévale. From Paris or from Calais (see routes from Calais) the easiest access is via Orleans, Clermont-Ferrand, the A75 and Béziers. Check out the guide to the Languedoc area. Among the most interesting sights and attractions in the vicinity of Carcassonne, the most noteworthy are. The Cathar castles - a series of magnificent ruined medieval castles, mostly in the Aude and Ariège departments. Toulouse - capital of the Occitanie region and the major city in southwest France, Toulouse , a little over an hour up the motorway, is a fine city with plenty to see. Limoux - 30 km south of Carcassonne, Limoux is an attractive small town whose claim to fame is that it is the birthplace of sparkling wine – the first sparkling wines having been produced here in the early 16th century, long before the idea spread to the Champagne region. Limoux also has an unusual piano museum. The Canal du Midi . Running from Toulouse to Agde, on the Mediterranean coast, the Canal du Midi is a UNESCO world heritage site. Its towpaths also make up one of France's great long-distance cycleways.... shaded from the hot summer sun by lines of ancient plane trees. Narbonne. Former capital of Roman Gaul, Narbonne is a typical Mediterranean French city. It has one of the best southern French cathedrals, attractive quays beside the Canal du Midi, and an underground Roman market and warehouses. Region: the Languedoc area of Occitanie. 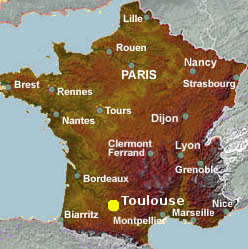 Lyon and Toulouse, via Narbonne: Bordeaux and Perpignan. Main sites: The citadel. The Canal du Midi (both UNESCO world heritage sites). Nearby attractions and sites: Cathar castles. See more below. Very attractive four-star accommodation 500 metres from the old city. Easy acess three star budget hotel with pool, 500 metres from the old city, on the way in from motorway exit. Easy acess modern two-star budget hotel only 200 metres from the old city, on the way in from motorway exit. except: photo of Porte de Narbonne by René Boulet. Creative commons licence. Carcassonne in 1851. Public domain photo from the Bibliothèque Nationale collection.